Mark Strauss does an excellent job describing and assessing the so-called “criteria of authenticity” used to evaluate the sayings of Jesus (Four Portraits, 359-62). I have expanded this list a bit using volume 1 of John Meier’s The Marginal Jew. The use of criteria for determining the authenticity of Jesus’ sayings are part of an inductive argument which can only lead to the likelihood that a given saying goes back to Jesus. If multiple criterion imply that a saying is authentic, that increases confidence in that saying. Dissimilarity (Discontinuity in Meier, 1: 171-174, also known as originality, or dual irreducibility). If a saying is unlike anything found in Judaism or the early church, then it is more likely to be correct. But there is a serious problem here: How can a historical Jesus be divorced from Judaism, the religion of the Hebrew Bible and the first century Palestine in which he ministered? Why Jesus reflect a culture different from Judaism if he was a Jew? Multiple Attestation. This assumes at least a two source hypothesis, If a saying is in Mark and Q, then it is more likely to be authentic. If a saying appears in Mark, Q, and Gospel of Thomas, etc, this “triple attestation” that is more likely to be original. On the surface, this seems reasonable although it assumes several things about source criticism. However, it is not applied consistently by some scholars. For example, Mark 10:45 appears in multiple layers of tradition (as defined by the Jesus Seminar), et the saying is dismissed as a creation of the church. Coherence (Meier, 1:176-177, also known as conformity, or consistency). The criterion of coherence states that whatever statements of Jesus that are supported generally by the other criteria are more likely to be authentic. This assumes that one has been able to isolate some authentic material using the other criteria and have established a database for dealing with other sayings. This is not unlike the Jewish method of judging a prophet – the Torah was the database by which prophetic books were evaluated. If they contradicted the Torah, they could not be authentic. Embarrassment (Meier, Marginal Jew 1:168-171, also known as contradiction). The pericope is not the sort of thing that the early church would have gone out of their way to create. If one were imagining a community of believers creating stories about Jesus, it follows that they would suppress stories that were embarrassing or difficult to fit into the developing Christology of the church. Meier uses the example of the baptism. Jesus (the sinless son of God) presents himself to John the Baptist, a sinful mortal, in order to be baptized, even though John’s baptism was announced as for repentance and the forgiveness of sins. Mark 1:4-11 has Jesus simply presenting himself for baptism, Matthew 3:13-17 has Jesus explain to John why baptism is necessary, Luke 3:19-22 places the arrest of John before the baptism story (as a flashback) so that the reader does not immediately connect John with the actual baptism. By the time John writes, there is no actual baptism, only the witness of the Spirit to the identity of Jesus. Rejection and Execution (Meier, 1:177). This element is quite different than the others. It assumes that Jesus was in fact arrested by the Jews and tried for something, and executed by the Romans. What might he have taught and done that would have led to that level of punishment? If he was a teacher of parables and short witty aphorisms, then he is unlikely to get himself crucified. Semitic Flavor. Strauss includes although it was not really one of the Jesus Seminar’s original criteria. If a saying or action of Jesus has a “pronounced Jewish or Palestinian flavor, it is more likely to be authentic” (361). His example is the use of the Aramaic word abba in Mark 14:36. The assumption is that Jesus spoke as a Palestinian Jew and (presumably) later writers would be unfamiliar with a Semitic context. This criterion may not be helpful if the writer is Jewish; Matthew could create Jewish things for Jesus to say, for example. Divergent Traditions. Occasionally authors preserve traditions which do not serve their purposes. In Matt 10:5-6 Jesus tells his disciples to not go to the Gentiles, yet in Matt 28:16-20 he tells them to go to all the nations. As Strauss points out, this criterion is difficult to use since we may not understand the purpose of the Gospel writer. In the example given, it is possible the situation during Jesus’ ministry was different than after the resurrection. In the end, do these tests achieve anything? It has become standard among conservative to state that the use of the Criteria tells us very little about Jesus and then dismiss them out of hand. But I like how Blomberg concludes his discussion of the criteria: these arguments build on faith evidence with does actually exist (Jesus and the Gospels, 221). I would unpack this statement in two directions. If one already has faith that the Gospels accurately record Jesus’ words, then the criteria of authenticity provide evidence in favor of that faith. We can be assured that we have accurate accounts of the sorts of things Jesus actually said. On the other hand, if one assumes Jesus did not say certain things (Son of Man, eschatology, etc. ), then the criteria will prove that assumption, Jesus could not have said the things the Gospels claim. In the end, these tests are still matters of faith, and pretending that they are objective is a sham. It is an inductive method, as I said. As such, it will never yield 100% certainty, but an inductive argument does move toward a higher probability of truth. In the case of a particular saying of Jesus, these methods can only conclude it is more or less likely Jesus said something. It is always possible someone argues a particular saying is highly probable to have come from the Historical Jesus, but (in reality) it did not. I suspect that is the case for some of the Gospel of Thomas sayings, maybe the Adulterous Woman story in John 8 (a highly controversial example!) But over all, a judicious and fair use of these criteria will allow a student to know there is a high historical probability Jesus said the things they already believe him to say. I am not sure this is a bad thing. Not at all. I agree. All I am saying is that nothing can provide us with faith if we, ourselves, don’t already believe and accept certain things. Of course, this doesn’t mean that we must not make use of scientific methods to do apologetics. On the contrary… PS: This whole series of posts is very useful. Thank you for all the thoughts. There are many subjective ways through the “criteria of authenticity” that we can view Jesus’ words as either even more valid than before or less valid, it depends on the lens of the viewer in this particular circumstance. Bu, for example, how can the criterion of dissimilarity possibly back up the authenticity of the words of Jesus when as P. Long puts it, “How can a historical Jesus be divorced from Judaism and the first century Palestine in which he ministered?” (The Words of Jesus and the Criteria of Authenticity) Or in the criteria of coherence, one Bible supporting Christian may be apt to find a more effective database to back up his belief in the legitimacy of the words of Jesus than the doubting skeptic. But when it comes down to the criteria of authenticity of the Word, one must simply not overly analyze or criticize, as many biblical scholars do, but understand that the Word is God breathed (2 Tim. 3:16), therefore of truth, and that, “no prophecy of Scripture comes from someone’s own interpretation.” (2 Peter 1:20-21) Scripture and the words of Jesus can often be over scrutinized allowing for a lack of faith in our judgment, or lack of judgment, of scripture. The ‘criteria’ implies there might be degrees of authenticity – leaving us with oxymoronic assertions that a saying of Jesus is ‘very authentic’, ‘possibly authentic’, ‘probably inauthentic’, etc. I have more questions: Does determining a saying as inauthentic clarify anything or does it lead to more confusion? Is ‘authentic’ synonymous with ‘authoritative’? J.M. Robinson in his ‘New Quest’ asserts that sayings Jesus did not say may be more relevant than actual sayings of the historical Jesus. Could Robinson be correct? Robinson could be correct, sure. I really doubt any saying was created out of nothing, everything in the Gospels attributed to Jesus is (IMHO) related to what he said. I think I would rather talk about degrees of certainty rather than degrees of authenticity. These tools are used to establish confidence (or not) in a particular saying. Back in the Jesus Seminar days, that confidence was thin, while other scholars use these methods to become increasingly confident. In both cases, these tools only prove what you already believe. As for the Robinson comment, a saying might be an accurate recollection of something Jesus used to say alot, even if the actual words are not precisely what Jesus originally said. I also doubt that the sayings were created out of nothing, but many higher critics say exactly that. The degree of certainty posited by the Jesus Seminar (JS), color coding and all, seemed to be an end in itself for many liberal scholars. When it became obvious that the JS enterprise was a cul de sac, several JS scholars jumped the ship that Bultmann and his disciples had launched. Many took to reader-response criticism, narrative criticism and canonical criticism – areas that focus more on the unity of biblical texts and, by the way, often less hostile to evangelical presuppositions. As to Robinson, I think he may have meant that whether a saying attributed to Jesus was actually spoken by Jesus is not necessarily related to the impact the saying has had on the church. For example: A scholar may state (however foolishly) that John 14:6 was never actually spoken by Jesus, but that same scholar cannot deny the impact of those words on the church and even the world. 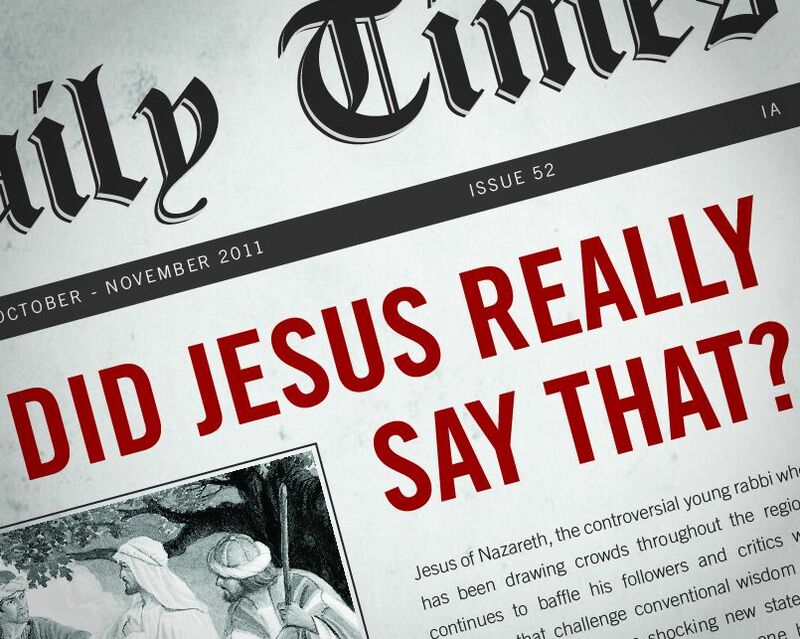 Like everyone else Is saying, it is true that the authenticity of Jesus’ words can never be 100% proven. I found it interesting what Dr. Long said about rejection and execution. I never thought about people believing that Jesus was being executed for something more than being a righteous teacher. In this element, could it be that Romans executed Him solely because they disagreed with his teachings? Or maybe it was His persistency of claiming that He was the Messiah that the Jews found to be worth arresting and crucifying. In Strauss’s book, he discusses the “burden of proof”. He claims that the burden of proof belongs to those who claim certain sayings of Jesus are authentic. “If a writer or historian can be demonstrated to be generally reliable, then the benefit of the doubt may be given to that writer in disputed cases” (Strauss, pg. 385). It is made clear in Luke 1, that he supplies the authenticity of his writings. Luke says in chapter 1 verses1-4, “Many have undertaken to draw up an account of the things that have been fulfilled among us, just as they were handed down to us by those who from the first eyewitnesses and servants of the world. Therefore, since I myself have carefully investigated everything from the beginning, it seemed good also to me to write an orderly account for you, most excellent Theophilus, so that you may know the certainty of the things you have been taught. ” Although this doesn’t quite prove how accurate “the red lettering” is throughout the new testament, Luke clarifies that the things he has written down come from a reliable source.